I'll be posting photos and writing about my travelling adventures soon. Stay tuned! In the meantime, sign up on our mailing list and I'll let you know when there's something new. Hello, to all my friends and neighbors in Byron Center...and Beyond!! My official name is Byron DeChicken (bet you didn’t know that), and I’m so glad to be a part of this community. My plan is to be here for as long as you would like me to be here. Lately, I’ve had some health issues and a family in Byron Center noticed, bought me, decided to provide health care, and is paying for my visit to the Fiberglass Chicken Hospital. The people at this hospital are professionals, not just quacks in their garage – I’m going to be in better shape than I’ve ever been! It has been a little rough, I’ve had years of standing in one place with no relief. I’ve developed cracks in my sacroiliac and my feathers have been flaking off white paint. Well, I haven’t been able to talk because of all the surgeries I’ve had lately, but I’m getting better every day. It appears that the doctor is recommending that I go south to a chicken rehab ranch for the winter and take a vacation! I’m really looking forward to that...sun and warm weather. Anyhow, after the trip to the spa, I’m going to start a blog to share my travel experiences. So stay tuned...I’m not leaving...just coming back stronger and maybe even as a more active part of the community. P.S. The family that’s taking care of me is working hard to make sure that, when I return, I will stay a permanent part of the community and never again have the threat of my being sold and removed from the community by a business. Remember...I’m your chicken, and Byron Center is my home! Please pass this e-mail on and check out my blog for continuing updates and entertainment. 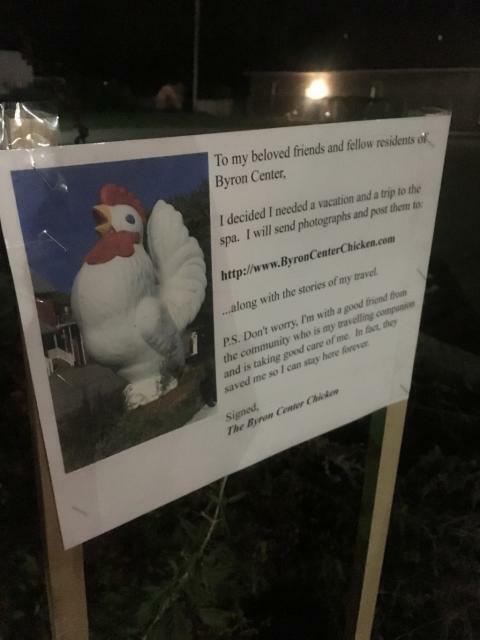 We can work together to keep the Byron Center Chicken here for all of us. ...along with the stories of my travel. P.S. Don't worry, I'm with a good friend from the community who is my travelling companion and is taking good care of me. In fact, they saved me so I can stay here forever. Sign up for my mailing list below to receive updates on my adventures! I'll be posting photos and stories soon, so stay tuned!